Gem City College has provided Cosmetology Training since purchasing the Quincy Beauty Academy in 1975. It features a large clinic for customers, dispensary, classrooms, and the appropriate atmosphere for the learning and practice of Cosmetology. Students will learn skills in haircutting, nails, perming, color, salon management, and other areas. 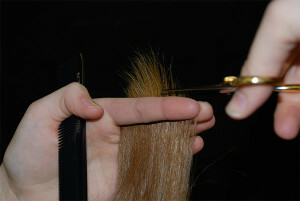 The demand for stylists exceeds the number of graduates available. The program requires 1500 clock hours or 75 Quarter hours of credit to complete. As you begin your study remember that we believe the students can achieve great heights in this environment if you are willing to learn and practice that which you are about to be taught. We believe you can succeed, and we will be there to provide you with the education and encouragement you'll need to get there. Many job opportunities await the successful graduate (hairstylist, salon owner or manager, color specialist, teacher, or salesperson). Provide beauty services, such as shampooing, cutting, coloring, and styling hair, and massaging and treating scalp. May apply makeup, dress wigs, perform hair removal and provide nail and skin care services. Excludes "Makeup Artists, Theatrical and Performance (39-5091), "Manicurists and Pedicurists" (39-5092), and "Skincare Specialists" (39-5094).